What Is Maine Harvest for Hunger? This public service campaign encourages gardeners to grow a little extra and donate the produce to local soup kitchens and food banks that serve the homeless and hungry. 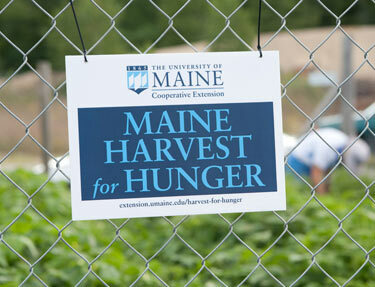 The Maine Harvest for Hunger program is administered by the University of Maine Cooperative Extension, with the efforts of Master Gardener Volunteers. It doesn’t take a lot to make a real contribution; even one additional row of vegetables can make a difference in your community. Last year York County volunteers donated over 60,000 pounds of fresh produce to help feed the hungry. In addition to home gardeners: school groups, 4-H groups, and local farms helped in the effort. The major local Maine Harvest for Hunger recipient, York County Shelter, annually serves more than 62,000 meals, provides 1,200 boxes of food to 3,500 people, and Thanksgiving boxes to 750 families. Maine Harvest for Hunger also distributes hundreds of pounds of food to pantries throughout the county, aiding many others. Fresh local produce, donated through Maine Harvest for Hunger, is so important at a time when government aid is decreasing and the number of needy people facing food shortages is increasing. Our mission is to provide an avenue through which the more than 70 million gardeners in this country can help the 31 million men, women, and children who go to bed hungry daily, see Maine Harvest for Hunger Program in the State of Maine for further information. On Behalf of All Those Who will Receive a Tasty Boost to Their Nutrition Because of Your Generosity, Thank You!